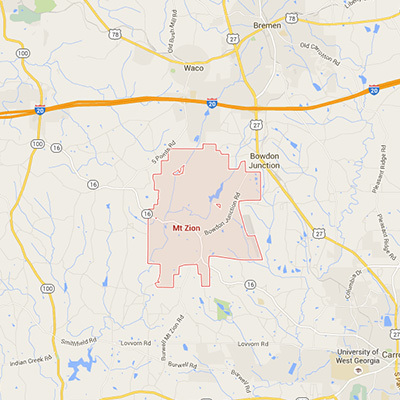 The City of Mount Zion was established in 1852 on land owned by the Creek Indian Confederacy. It became known as Turkey Creek Mills, named for the abundance of wild turkey found in the area. Mount Zion Methodist Episcopal Church, established 1865, soon became the center point of the community, and in 1878 the name Turkey Creek Mills was changed to Mount Zion. The church expanded and in 1880 started one of the most successful seminary schools founded by the M.E. Church. The city was officially chartered in 1912, re-chartered in 1953 and again in 1978. Sitting on a hill in the midst of the rolling northwest Georgia countryside, Mount Zion is located five miles from Interstate 20 and eight miles west of Carrollton (Carroll County) on GA State Highway 16, not far from John Tanner Park.